Where Can You Rent Forklift in Denver - Be Certified Today! Renting forklift makes best sense compare to buying a brand new or used one mainly because the job to be done is just for short span. Renting is also a good choice if you have a fixed budget and purchasing is something you cannot afford at the moment. These are the frequent reasons we hear from people, and if you are one of them, you might as well read this tutorial so that you can make an informed decision. What Are The Things You Need to Consider When Renting Forklift? Before you rent a forklift, it is vital for you to know the lifting capacity of the equipment you need. To do this, determine the purpose and task you want the forklift to complete. In a typical warehouse setup, counterbalance and reach truck are needed and these trucks usually have the lifting capacity of 3,000 lbs to 6,000 lbs. In case that you need a more powerful machine, ask then rental company what can they provide for you. Will you be using the forklift indoors or outdoors? If most of the work are outdoors, then you may opt to use gasoline or diesel type ones, for obvious reason. Gasoline or diesel-powered trucks are more powerful and can handle more loads. If the works to perform are indoors such as in the warehouse, then electric or LPG-powered forklifts are right for you, they don’t emit smoke and carbon monoxide which are very dangerous in confined space. Determine the maximum lifting height of the forklift you need. You do not want to rent an equipment that could not reach the desired lifting height – it will be useless and fruitless. To do this, measure the height of the racks you have in your warehouse. Ask assurance from the rental company that the forklift is free from mechanical defect and in very good working condition. You cannot afford to have equipment that breaks down during full swing of work. Ask from the company if they can deliver the forklift to the job site and pick it up when it is finished using. Negotiate if they can waive the pickup/delivery rate particularly if you are close to where they are. When you are finished with equipment, call the company to tell them, otherwise, they will assume that you are still using it, they could charge you for more. The most important factor when renting a forklift is money. Set the required budget. Negotiate with the rental company about the budget. They usually give lesser rates especially when the contract duration is lengthy. Where Can You Rent A Forklift? If you are searching for a forklift rental, here are the forklift dealers and equipment rental companies in Denver and in other surrounding areas we can recommend. Renting vs. Purchasing: What Best for You? If money is not an issue for you when acquiring a forklift for your business, buying could be your choice to take. Owning a forklift is basically the same as owner a car. It need proper maintenance and that means additional operating cost for your business. If you want to purchase a forklift and you just want to try it out first if it suits to your need, then renting it could be an intelligent pick to do before buying it. Did you know that renting is more costly than buying if the work project at hand is extensive and for long-term. Examine the work duration, if it is brief, renting is a good option. If your line of business deals mostly with material handling, and you use forklifts for many hours every single day, set aside renting, purchasing could be your best choice. When the production swing in full and you cannot cope up with the work demand, renting a forklift for a week is ideal. When your equipment on site breaks down you badly need a substitute, contact a company to rent. 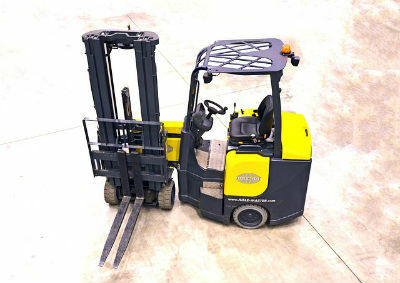 Renting forklift is now becoming popular nowadays for businesses due to myriad of good reasons. Renting presents a lot of advantage and one of the benefits is cost effectiveness. If you are in Denver and you are in need for forklift rental, contact one of the companies above. Define your requirements, consult with them. They could give flexible plan to suit your budget and demand. What is the shortest time I can hire a forklift for?